Curlformers Corkscrew Styling Kit 14"
Wild Curls Inspire Wild Success! Perhaps the most common piece of feedback we receive from customers is about our shipping costs. Because our manufacturing plant is located in a remote part of Northern California, it can be expensive to ship items from here to all points around the world. It may (or may not) be helpful to know that Jessicurl does subsidize the shipping costs for our customers. We receive discounts from our primary carriers, roughly 20% lower than the actual price, and pass these savings onto you. If we have charged you $8.00 for shipping, it likely cost us about $10.00 in shipping charges from the carrier. We do not make any profit on our shipping charges and we do not recover any of the labor or material costs for preparing and shipping your orders in the shipping charges you see on your order. Shipping cost is primarily determined by the weight of an order. For all our carriers, our overall cost per pound drops as your order gets larger. This means that, if the product cost of your order comes to $100, the percentage of that cost dedicated to shipping would be smaller than it would be for a $16.95 order. Every month on the 15th we offer free shipping for addresses in the U.S. The coupon code (FREE) is posted on our homepage so be sure to check each month on the 15th as it is only good for 24 hours. 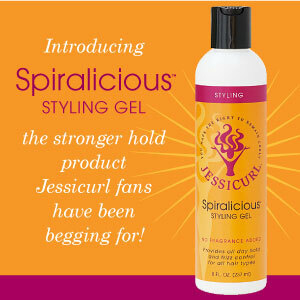 Last but not least, many of you love to buy Jessicurl in person when you can and we love that too! If your favorite salon doesn’t carry us, send us an introduction to your neighborhood curly salon or beauty supply store and, with any luck, you will be able to buy Jessicurl on your next visit. You can send us details about your favorite salon or beauty supply store by emailing [email protected]. Provides all day hold and frizz control for all hair types.For a while now, our customers have been asking us to provide them with a stronger hold styling product. If we had to rate our current styling line up, Gelebration Spray and Rockin’ Ringlets would be light hold, and Confident Coils would be medium. That definitely leaves room in the category for a firmer hold styling product and we hear you that you’ve been filling that need elsewhere. Well, you don’t have to anymore, Jessicurl fans! After months of testing, we’re super excited to introduce Spiralicious Styling Gel, the thicker, stronger hold styler you’ve been asking for. Join us and Follow us!